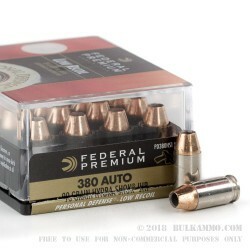 These .380 Auto rounds from Federal's revered Hydra-Shok line will be a favorite among owners of the Ruger LCP, S&W Bodyguard, Kel-Tec P3AT, and Glock 42! The Hydra-Shok design consists of a jacketed hollow-point (JHP) bullet with a deep reaching cavity bordered by precise jacket skiving and occupied by a tall, lead plunger. The center structure prevents clogging and preserves the round's ability to expand upon impact with a threat. A projectile weight of 90 grains helps the round match the most popular training loads in this caliber. During entry, the bullet's design causes it to expand outwardly while penetrating to an adequate depth and delivering maximum energy to target's vitals. 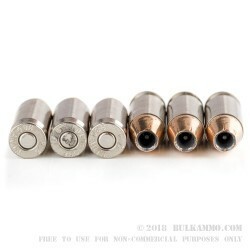 The projectile is secured within the crimp of a reloadable brass casing which bears a second, lighter crimp that is intended to prevent setback; this maximizes accuracy potential despite jostling recoil while also preventing catastrophic failure. The casing and it's clean-igniting Boxer primer are nickel-coated for superb corrosion resistance especially in IWB holsters and belly bands where a carrier's personal humidity abounds. 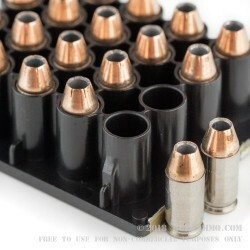 The rounds are loaded to a muzzle velocity of 1,000 feet-per-second for light recoil with little ballistic compromise. Manageable impulse is highly important when running small .380 ACP pistols with very little grip space. 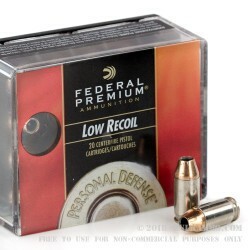 Federal Premium is an U.S. based company that is well known for consistent quality and top tier materials. Their personal defense loads draw on nearly nine decades of experience as well as the latest in production technology to give shooters the best fighting chance.